There are a number of actors who gave incredible performances, but you may have never seen their face. Actors like David Prowse, who played Darth Vader in the Star Wars films, Kenny Baker, who played R2-D2 and Bolaji Badejo who played the "xenomorph" in Alien. One actor that was prolific in the 80's and 90s, is the late Kevin Peter Hall. At 7' 4" tall, he is one of the most imposing character actors ever. In 1987 he got the role of the alien in Predator (1987) and changed the face of cinema. But, we never saw his face, unless you were observant enough to see him piloting the helicopter at the end of the film. Here's a clip talking about the man and the costume in the behind-the-scenes film "The Making of Predator." 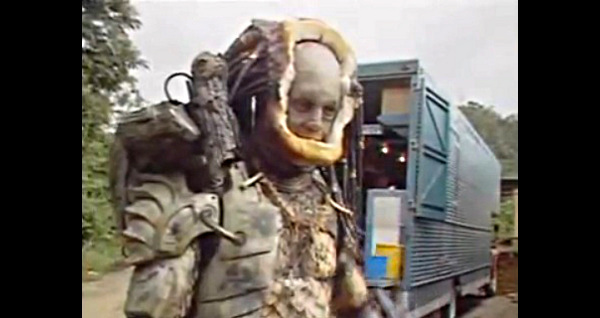 If you've never seen Kevin Peter Hall, or want to know how they made the costume, check it out. There you are. Now, you can now say you met the Predator. What do you think of Kevin Peter Hall and the Predator movies? Did you learn anything from the video? Is he still alive? Or am I thinking of someone else who passed away? Just got to the end of the clip - I was right that he passed. Nice that they designed the mask so it could be removed in between takes. Sounded like he was a great guy. Wasn't Jean-Claude Van Damme supposed to be the Predator originally but then they didn't like how the Predator looked or something and they got him. Incidentally, I also recall that Peter Cullen (the voice of Optimus Prime) did some Predator noises. Looks like Darth Vader at the end of Return of the Jedi. Now go, Danny Glover. Leave me! Missed you Maurice! I love Kevin Peter Hall. he really was an awesome character actor. He was in Harry and the Hendersons and I remember him from 227. Yes Alex, he sadly died of AIDS from a blood transfusion after a car accident. One of the great actors of all time. I like how they sais he never complained. He was Pat. The original costume looked ridiculous in the jungle and Winston had to design a new one. I didn't know Cullen did the Predator voice. Is there anything the man can't do? He does kind of Tony. "Ahnold, I am your father!" Melissa, I missed you too! Good to hear you're back. Hall was brilliant in Harry. He made the movie with his expressions. Arnold's father was a dumbbell.